The U.S. is deploying special forces on the ground in Lebanon to provide training for the Lebanese Armed Forces (LAF) for missions that partner with Hezbollah—Iran's most valuable terrorist ally—against ISIS. Pentagon spokesman Eric Pahon told the U.S.-based Al-Hurra Arabic TV network that American troops are there to provide assistance for the upcoming offensive against ISIS in the northeast border region in which the LAF will attack from from inside Lebanon while Hezbollah advances from Syria to the east. Pursuing the twin Middle East objectives of destroying ISIS and pushing back against Iran was always a dicey proposition. Even with meticulous military and political planning, ensuring that one doesn't gain strength at the expense of the other was bound to be a task fraught with difficulties. That's what makes the decision to boost Iran and its proxies in order to finish off ISIS in Syria so confounding. 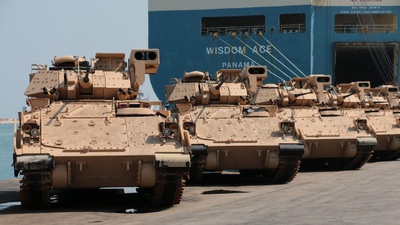 Military sources also told the London-based Arabic daily, Asharq al-Awsat, that the American presence is "to monitor the U.S. military aid delivered to the army," a reference to the $1.4 billion in security assistance the U.S. has provided Lebanon since 2005, $80 million of which the LAF received last year in equipment and training. Putting an exclamation point on the matter, on Monday the U.S. delivered eight M2A2 Bradley Fighting Vehicles (the first of 32 total) and armored field artillery ammunition supply vehicles to the LAF. The U.S. ambassador to Lebanon, Elizabeth Richard, explained in a statement how the United States "has intensified its engagement and support to the Lebanese Army over the past few years," and went on to provide an impressive list of weapons, munitions, and vehicles delivered in the past 12 months alone. "America's support for Lebanon," she concluded, "is based on the shared interests of the American people and the Lebanese people." The problem with the policy expansion in Lebanon is that the LAF today is simply another arm of Hezbollah, the terrorist group that runs Lebanon. Even Sunni politicians like Prime Minister Saad Hariri, who visited President Trump at the White House in July, are forced to play by the Shiite proxy's rules. That means U.S. support for the LAF is helping Iran, which spawned Hezbollah in Lebanon in 1982. That news should be concerning because until 9/11, Hezbollah held the distinction of being the terrorist group responsible for killing the most Americans. The genesis of this backward U.S. policy has its roots in U.N. Security Council Resolution 1701, which was passed in the wake of the 2006 Israel-Hezbollah war. As Levant specialist, Tony Badran of the Foundation for the Defense of Democracies explained, the resolution was later reinterpreted by the Obama administration during the negotiations to reach an agreement over Iran's nuclear program. That shift in focus remains the policy of the Trump administration today. In the wake of the 2006 war, UNSCR 1701 was designed to disarm Hezbollah and prevent their resupply and illegal smuggling of weapons from Iran and Syria. It also called for the deployment of the LAF throughout Lebanon to assert its sovereignty. Back then, "the extension of the control of the Government of Lebanon over all Lebanese territory" referred to its independence from Syria, whose soldiers finally left Lebanon after a 30-year occupation a year earlier. "The theory then was that Hezbollah had really taken it on the chin," a senior White House official explained to me at the end of June. "General John Abizaid, the CENTCOM commander, really got this going because he thought now is the time to build up the Lebanese state so that it can be a counter-weight to Hezbollah's power throughout the country and that over time, the LAF would eclipse Hezbollah as the main military power." "Well, that hasn't happened," he admitted with raised eyebrows and a shake of his head, "but that doesn't mean that we shouldn't have done it. It means what we did we probably could have done better." Fast forward a few years after several crises and Hezbollah has taken over all the levers of power in the Lebanese state. They didn't disarm; they resupplied and then added more missiles of increasing sophistication and lethality that are capable of carrying larger payloads with vastly improved accuracy over much longer distances. In fact, according to official Israeli estimates, the U.S.-designated terrorist group that is pledged to Israel's destruction has some 150,000 rockets and missiles today—a 12-fold increase over the 13,000 they held before the 2006 war. They even turned some of their weapons against the Lebanese people in May 2008 after a 17-month long political crisis. Meanwhile, Hezbollah members and their recruits continued to penetrate the LAF, which was supposed to be representing Lebanese independence in the face of internal and external threats. Several years later during the nuclear negotiations with Iran, Barack Obama reinterpreted the resolution "to fit its regional pro-Iran policy," Badran explained. "Trump's predecessor publicly recognized the need to 'respect' what he called Iran's 'equities' in Syria. That was a euphemism for Iran's ability to maintain its bridge to Hezbollah in Lebanon." As such, in the thick of the nuclear negotiations with Iran in 2014, Obama altered the mandate of UNSCR 1701 and dropped any mention of the parts that demanded Hezbollah disarm or called for the prevention of weapons smuggling. They focused instead on combating "Syria-origin Sunni extremists," which as Badran pointed out, was in turn adopted as the State Department's standard language in its annual Country Reports on Terrorism. When the U.S. put together another arms package for the LAF in 2015—that included laser-guided rockets and light attack aircraft—it was justified on the grounds it supported the implementation of UNSCR 1701. Likewise, when the State Department released its most recent updated Country Reports on Terrorism in mid-July, the identical language the Obama administration used in 2014 appeared. The rationale behind the expansion of U.S. assistance to the Lebanese Armed Forces was explained to me weeks before the Lebanese prime minister visited Washington and before it became policy. As the senior White House official put it, "there's a spectrum" when it comes to the LAF. "Different parts of the LAF might be at different places on the spectrum." He went on to explain that the U.S. needs to be "smart with our interaction with them" to discern where their loyalties lie. "If you come to a point where Hezbollah begins to wither on the vine—for whatever reason," he said, elaborating on the goal of the vetting process and cooperation, "you're still going to want someone to be the last man standing who is not, for example, a militia" that is removed from the mainstream. "So people who just call for us to shut off the tap to the LAF, or suggest that if it comes to it and Israel has to take down Hezbollah then they should take down the LAF too—well, it would seem very much to me to be a case of throwing out the baby with the bath water. That's my personal view." That conversation took place in the waning days of June and as he said, "We don't have a policy on this yet. But I would say that the idea that we should just cut the LAF off is shortsighted. For as many flaws as it has—and I've been pointing them out for years—it still doesn't mean we should stop. It means we need to be smarter about doing it. That's my personal opinion." Tony Badran argued that Prime Minister Hariri's recent visit with President Trump was "part of a coordinated, multifaceted information campaign to swindle the U.S. government into continuing its military support and extending political cover for the evolving pro-Iran order in Lebanon and Syria. Everyone—Hariri, Hezbollah, the Lebanese Armed Forces (LAF) and its supporters and publicists in Washington—is in on the con." It would appear, then, that they were not only pushing on an open door but they had the White House at "hello." Whether this rationale formed the basis of what would become U.S. policy, or whether the decision is merely due to existing policy inertia and the clever pro-Hezbollah information campaign, a few things are clear: Israel comes out as the big loser in all of this and Hezbollah, Iran, and the Syrian butcher, Bashar al-Assad are the winners. The most the U.S. can expect from this arrangement is a telephone number to call if Hezbollah and the Lebanese state collapse—which is less likely to happen when the Trump administration contributes to Iran and Hezbollah's regional designs. Perhaps these problems in policy will come out in the wash when the Trump administration finally decides to adopt an overall strategy to deal with Iran. Maybe then the focus will take into account the whole Middle East chessboard, rather than just a corner where tweaking military tactics on the margins serves as a substitute. Until that day comes, America's recent shift in Lebanon isn't merely a continuation of the existing Obama-era policy but rather its expansion. And that likely won't sit well with those hoping Mr. Trump would bring a course correction to Washington.